The traditional Japanese diet has received global attention in recent years as food that aids longevity. People believe that Japanese food is healthy, being based largely on fish and vegetables compared to Western food, which contains a lot of animal fats and makes it easy to take in too many calories. Japanese cuisine (washoku) was cultivated over many years of history and is the key to the longevity of the Japanese, and as such, it contains a few tips for healthy dietary lifestyles. On December 4, 2013, “Washoku, traditional dietary cultures of the Japanese, notably for the celebration of New Year” was inscribed as a UNESCO Intangible Cultural Heritage. Drawing out the inherent flavor of ingredients abounding in nature, Japanese cuisine has gained global attention for its beautiful presentations of seasonal food. Furthermore, Japanese food has also been applauded for the way it provides a healthy nutritional balance as a result of ichiju-sansai — the unique Japanese dietary style based on one soup and three dishes. According to date published by the Ministry of Health, Labour and Welfare (2017), the life expectancy of the Japanese is among the world’s top, standing at 81.09 years for men and 87.26 years for women. It is said that the reason for the longevity of the Japanese is related to Japanese cuisine. A large amount of the dietary intake from Japanese cuisine comes from grains, primarily rice, and fish, with a relatively low amount coming from animal fats. 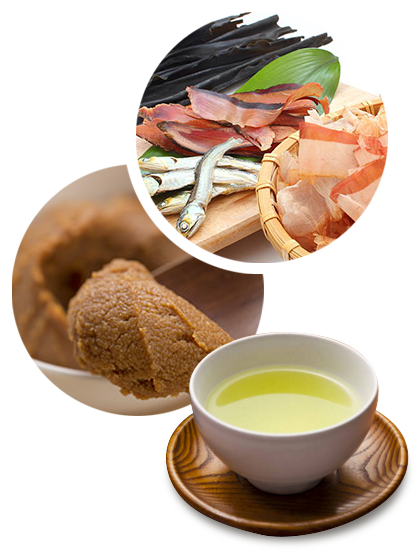 The umami flavor unique to Japanese cuisine, from sources such as dried bonito flakes or kombu, has led to a reduced intake of animal fats, supporting the longevity of the Japanese and preventing obesity. It is also said that eating soybean products such as tofu, natto, and miso helps to prevent arteriosclerosis (hardening of the arteries). Additionally, green tea contains antioxidants such as catechin and vitamin C, and the custom of drinking green tea is believed to also help prevent hardening of the arteries, as well as to help prevent illnesses such as cancer. The basic components of Japanese cuisine are rice and miso soup, to which a main dish and a side dish are added to make the basic menu. As rice has a light flavor, it goes well with any dish, whether Japanese, Western, or Chinese, and this is what creates the diverse variety of Japanese cuisine. Japanese cuisine is a testament to the entirety of the knowledge gained by our ancestors, accumulated over many years and hard-won through experience, allowing them to enjoy a variety of sources of nutrition without ever tiring of their daily meals. 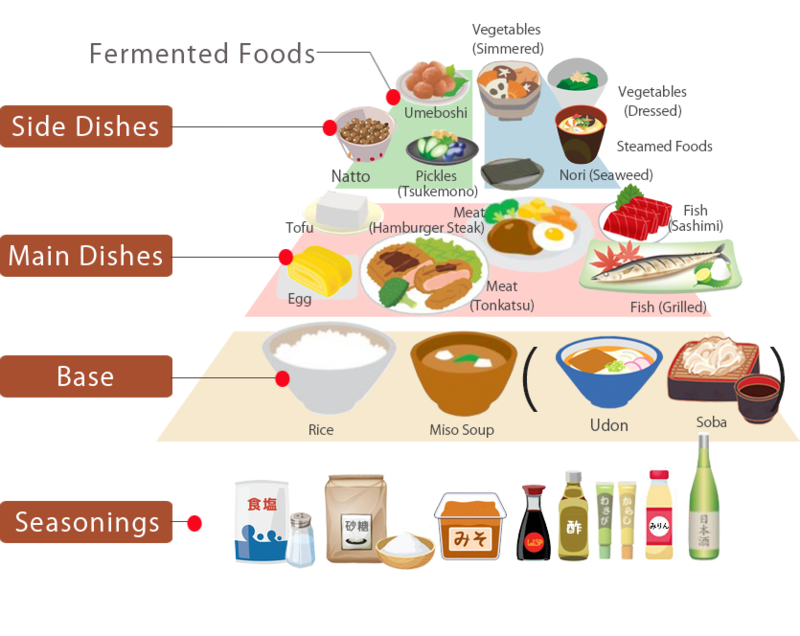 Aside from seasonings such as miso, soy sauce, and vinegar, Japanese cuisine also uses numerous fermented foods, such as natto and pickles. Fermented foods keep for a long time and are highly nutritious, and have gained attention for being good for one’s health. 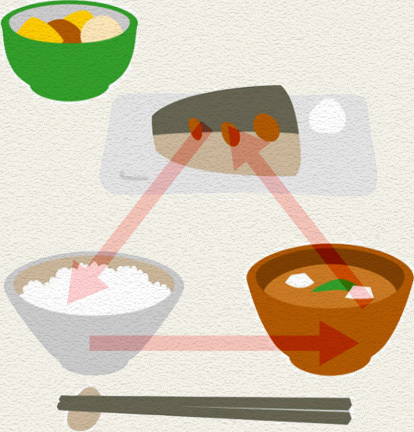 Japanese cuisine is based on ichiju-sansai (“one soup, three dishes”), the combination of a soup, a main dish, a side dish, and rice, the main constituent of the meal. Main dishes use fish or meat, while side dishes use vegetables or beans. Soups consist of miso soup or clear soup containing vegetables, tofu, and seaweed. Vegetable pickles are then added as an accompaniment. Compared to Western food, which contains a large amount of meat, the primary dietary intake from Japanese food comes from rice, with a large amount of vegetables, seaweed, and seafood, and this is held to be low in fat and calories. Dashi, which comes from ingredients like dried bonito flakes or kombu, is one of the key features of Japanese food. Dashi is rich with umami flavor, which enables it to make foods with light flavors taste even better. Cultivation of soybeans in Japan is said to have started in the Jomon period (14000 – 300 BC) of Japanese history. Soybeans are referenced in the Kojiki, an ancient Japanese text, and later, during the Asuka (538–710) and Nara (710–794) periods of Japanese history, they were the main ingredient of hishio, which was the prototype for miso and soy sauce. From the Kamakura period (1185–1333), production of tofu, miso, and soy sauce, which originated in the diet of Zen priests, became widespread. Japan had no custom of eating animal meat for a long period of time, and as such, soybean products were prized as a good source of protein. Protein is one of the building blocks of the body, used to create muscles, organs, fresh blood, and sturdy bones. Of the 20 amino acids that constitute the protein in our bodies, nine are called “essential amino acids.” These essential amino acids cannot be synthesized in the body, and must instead be taken from food. Intake of a good balance of essential amino acids is a pre-requisite for creating sufficient protein in the body. If there is a shortage of any of these nine essential amino acids, the body cannot create sufficient protein, even if the rest are in plentiful supply. To give an example, let’s compare the workings of the essential amino acids to a bucket. Let’s say we have created a bucket from nine planks of wood. If all nine planks of wood are the same length, then there is no problem, but if only one of these is shorter than the rest, then the bucket cannot store as much water (protein) as it should. The body can only create as much protein as the lowest amount of one of these essential amino acids will allow. 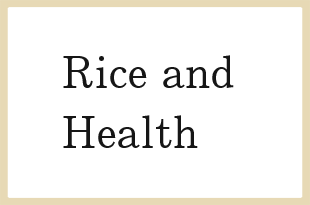 White rice contains a large amount of the nine essential amino acids, but with a shortfall of lysine. Soybeans, however, contain a sufficient amount of all the essential amino acids. Combining white rice with soybeans allows for a well-balanced intake of all the essential amino acids. The rice (white rice) and miso soup (soybeans) that serve as the foundation for Japanese cuisine are a fantastic combination that allows you to reach the standard values for essential amino acids. 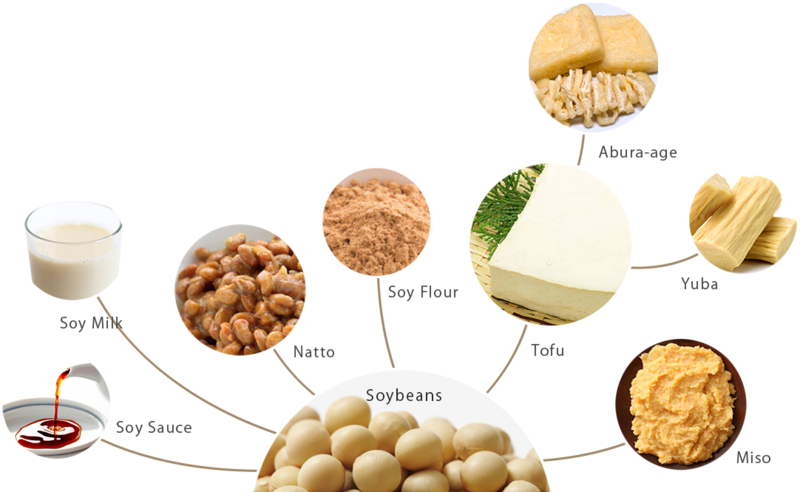 In Japan, a wide variety of diverse processed foods is made from soybeans. For example, there is miso and soy sauce, both essential seasonings in Japanese cuisine, as well as the fermented foods of natto and tofu, which is made by using nigari (magnesium chloride) to solidify soy milk. Koshihikari, a cultivar of rice that was registered as a numbered cultivar in 1956, is now the most commonly cultivated type of rice in Japan (as of 2017), consisting of approximately 36% of the national planted area. When it was first registered, its good flavor came at the cost of it being vulnerable to disease and prone to collapsing as a result (making it difficult to harvest), and as such, it was often grown in small amounts for home use or sharing. However, around 1969–1970, the supply of rice in Japan outstripped demand, and policy shifted to reducing rice cultivation. It was then that people looked for quality, rather than quantity, of rice. After this, cultivation of Koshihikari began to gradually increase, as qualities other than its flavor that had yet to be discovered since its registration became apparent: for example, it has high storage stability (it tastes good even if it’s not fresh), and it is resilient to both high and low temperatures. In 1979, 23 years after its initial registration, Koshihikari became the most widely-planted cultivar of rice in Japan. During Japanese meals, the rice, soup, pickles, and main/side dishes all come out together. The practice of eating from each of these a bit at a time is called sankaku-tabe. This is a way of eating that is unique to Japan, which draws out the flavor of the food. 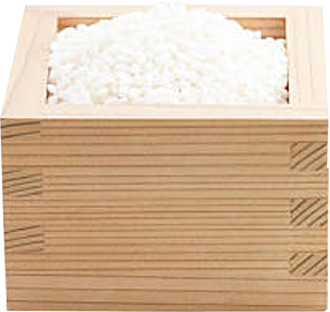 The key to sankaku-tabe is to focus on the rice: eat some rice, some soup, then return to the rice. Next, eat some of the main or side dish, then return to the rice. This way of eating is said to have the following advantages. By having rice between portions, you can avoid eating too much protein or fat, allowing for a good balance of nutrition without leaning too much in one direction. You can moderate the flavor of your food to your liking, for example by eating large amounts of rice while eating food with strong flavors, or eating smaller amounts of rice between portions of lightly-flavored food. Returning to the rice after eating main or side dishes refreshes the palate, allowing you to fully enjoy the next item. By eating your meal with rice, which has a simple flavor that goes with any dish, you can enjoy the meal right through to the end without tiring of it. Nori-ben is made by sprinkling finely-chopped dried bonito (or kombu) over freshly-cooked, fluffy rice, then laying a sheet of nori seaweed on top. Next, fried white fish, chikuwa fish cake tempura, kinpira burdock (burdock chopped and cooked in soy sauce), and pickles are then laid on top of the nori. 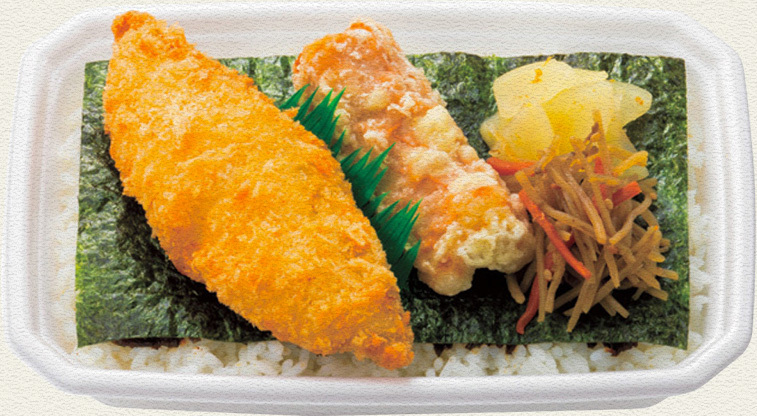 When you open the bento box later, you’ll find that the rice has become infused with the flavor of the nori and bonito. The flavors of the fried white fish, the chikuwa tempura, and the pickles synergize wonderfully with what is already a delicious meal. One could call nori-ben a “soul food” that represents Japan, containing a collection of foods that can be enjoyed casually and go great with rice.